Pen Y Fan, the highest peak in South Wales, is a favourite of both novice and experienced walkers. It is estimated that more than 350,000 people climb the 886m (2906 ft) summit each year. In 2019, as part of Prostate Cymru’s Sport and Community Executive Chris Leyshon’s 100,000 challenge, The Big Ten has been introduced. The event involves ten climbs of Pen Y Fan in twenty-four hours which is the equivalent of climbing Everest! The first climb will start at 7am on Sunday 5th May. There will be a core team of walkers including Chris and the charity’s Events and Marketing Executive Owen Pugsley who will complete all ten climbs. Some of Prostate Cymru’s ambassadors and supporters will be joining the team for one or two legs of the big ten climbs. 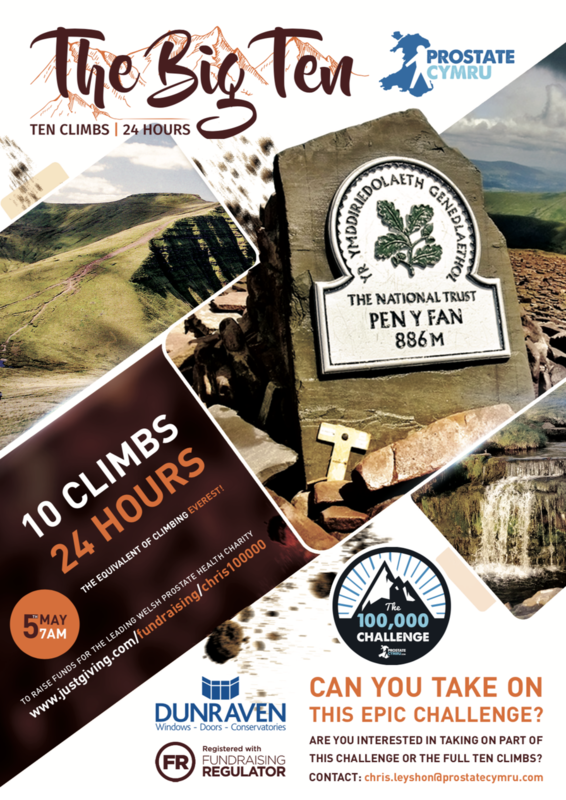 Whether you are brave enough to take on the whole epic challenge or want to take on part of the challenge such as simply doing a single climb please contact chris.leyshon@prostatecymru.com for more information.